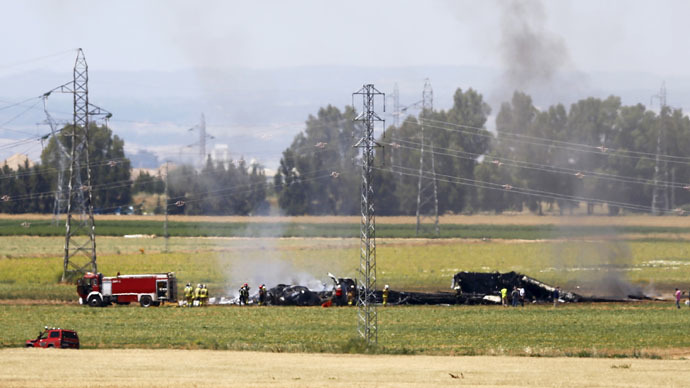 Four people are dead, and two seriously injured, after an Airbus A400M military transport aircraft crashed into a pylon near Seville, in southern Spain. “We express our deepest sympathy,” said a statement Spanish prime minister Mariano Rajoy, who canceled a public election rally, following the accident. “They were our fellow countrymen." The€150 million A400M, assembled in a plant in nearby Seville, was on a test flight, prior to being shipped to Turkey, when the crew contactedair traffic controllers about a technical failure after takeoff. The model had been beset by multiple technical hitches and cost overruns, before finally entering service in 2013. The aircraft crashed only 1.6km north of international San Pablo Airport, emergency services said. Though the crash occurred outside the perimeter of the airport, the facility is not operational, El Pais reported. Some flights were diverted to the cities of Malaga and Jerez. Numerous images on social media showed firefighters spraying the smoldering wreckage of the plane in a field. The Airbus A400M Atlas is a tactical airlifter that can perform various missions, including electronic surveillance and aerial refueling. The A400M's maiden flight took place in December 2009 from Seville, Spain. Germany, Spain, France, Belgium, Luxembourg, the UK and Turkey are the aircraft’s primary operators. The UK Ministry of Defence said it was pausing its own A400M flights, pending the first results of the investigation.